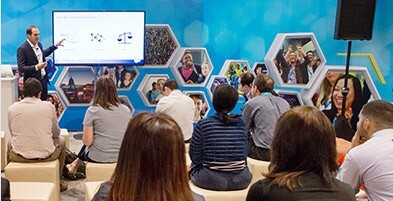 Salesforce’s European leg of its annual world tour, Salesforce World Tour 2017 will be hosted in London on May 18 at London Excel Center. As with previous tours, it will be packed with events and filled with opportunities to learn, meet people and network. However it’s possible to get lost in the chaos of the mega event so here are a few tips on how to spend your day fruitfully and return from the tour with new ideas, contacts and hopefully better ways to connect with your clients. It sounds so basic but every year many people travelling for conferences are stranded at airports or stuck in traffic of a city that they are not familiar with. Due to poor planning, they find themselves scuttling to reach an event that they took leave from work and have paid to attend. Don’t let that happen to you! You can prevent a poor start of your day with a few simple tweaks. Plan your mode of transport. Though it’s very easy to get anywhere in London, decide beforehand what will work best for you and wherever possible, get your tickets online. Have an idea of the expected travelling time, find out whether you have to use multiple means of transport, what stop or station to get off the bus or train and if you are going by car where will parking be available. Find out if you will have a travelling companion/s from your company and plan the trip accordingly. 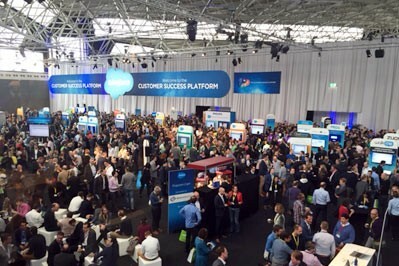 Like the 1000s of Salesforce enthusiasts heading to Salesforce world from across the UK, be organised with all your stuff, like air tickets, itineraries and hotel reservations. This way you will save precious time and energy and guarantee a stress-free start on the day of the event! 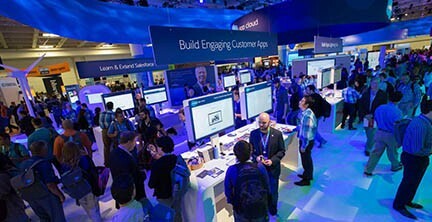 Whether you are a small business owner or work for a large one, the expo floor will give you the opportunity to see innovative products by Salesforce and its partners in action with demos from exhibitors from several industries. You will get a chance to see up close how the new products namely Salesforce Einstein, lightning, Quip and more work for Salesforce clients and partners. Nothing compares to practical demos of a product to give you genuine understanding of functionality. The expo floor is where you get the most face to face interaction with people, are able to ask questions and get a real perspective of how these products could work to facilitate or scale your business. Visit as many stalls as possible and you could come across a new Salesforce partner App that is just perfect for your business needs. You will also get to witness competitors in action and see how they are using Salesforce to gain an edge. If you are an exhibitor this year, well done, you already have the edge with this opportunity to promote your brand! 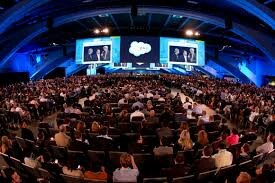 Keynote speakers are Salesforce executives and special guests who are prominent industry leaders in different fields. Every year they energise, motivate and inspire attendees. The keynote address really sets the tone for the day with success showcases, announcements and innovative ideas. This year, you can expect Artificial intelligence to be one of the highlights given that Salesforce Einstein HighVelocity Sales Cloud is the latest platform release by Salesforce. Prepare to be impressed with the changes that AI is going to bring to all aspects of our lives in the near future. As a salesforce enthusiast, make sure you learn something new at the breakout sessions. There will be customised technical and nontechnical sessions for developers, architects, marketers, Human resources, Sales, entrepreneurs etc. The breakout sessions will be published on Salesforce.com some time before the event, so it’s a good idea to go through them and pick the ones that you want to attend. It’s great to participate in something that’s in your own field but also always a good idea to broaden your perspective and attend something that piques your interest or that seems fun. Do remember that seating is always first to come first serve, so do plan ahead and register on the spot for them. One of the biggest opportunities that the conference offers is the chance to network. If you are Marketer or business owner, make sure to have your marketing material ready. However be careful not to make it overwhelming, people don’t want to be handed burdensome folders! Reach out to peers or clients whom you think will be there and arrange to meet up over coffee. Sometimes checking in with existing clients helps a lot. They may introduce you to further prospects and may lead to new business opportunities or further branding. Make sure you to remember as much as possible about people you interact with and try to build a personal connection. Everyone appreciates it when you remember any significant detail about them. It feels like you are more than just a business card! If you are a Salesforce freelancer, you could even spot a salesforce job opportunity and move your Salesforce career ahead. 6. Follow up after the event. You will surely meet many people but at the end of the day, the most important thing is to convert your new acquaintances to real connections. As a Salesforce user, you most probably already use social and professional media. So it’s a good idea to connect with people you just met on Linked in, Facebook or Twitter while the meeting is still fresh in the mind and people are more receptive to build upon the contact. Keep in touch, set up meetings and nurture the relationships that you find value in. Since you have the opportunity to be away from the daily routine of work, make the most of your day. Attend the luncheon and dinner parties, have fun with old and new acquaintances. Take pictures and try to meet people who impress you. Lastly, May is the best time to be in London, so if you get the opportunity, explore the beautiful city as well!